Our New Children and Families Worker! 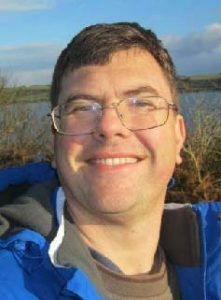 I am Marcus Jones, 45 and have two teenage children who live with their mother in Falmouth. My accent isn’t easy to place, I was born in Scotland, I’ve lived in Wales and grew up in Northern Ireland. My English years started at the age of 17 in Taunton, my early adult years in the Black Country and I’ve been in Cornwall for nine years now. I have been involved in children’s work within the church from the very beginning of being a practicing Christian back in my Taunton days helping with Junior Church and the youth evening service. I’ve been a Boys’ Brigade captain, helped with weekends away events, was a children’s worker to a joint Anglican/Methodist venture in the West Midlands and for Churches Together in the Falmouth and Penryn. More recently I have been working for the short breaks services for children with autism. Ten of my favourite things in no particular order; Bach, bagpipes, Van Gogh, Simpsons, sailing, Pixar films, dogs, curry, and Harry Potter. If I could have one Harry Potter spell it would be “Accio” the summoning charm- not because I’m too lazy to stretch over to the tv remote but because I seem to spend a lot of time looking for something, usually keys. Utopia for me would be a keyless society. My favourite Joke is: Knock knock – who’s there? Little old lady- Little old lady who? I do actually listen to yodelling music though I can’t do it myself and as you get to know me you’ll discover my jokes won’t improve! Working with children and families is a great privilege and a most wonderful thing to be involved in. In it we are answering Jesus’ invitation to feed his sheep and his lambs and yet it is in the people we are serving where we meet God reflected back on us and often in quite unexpected ways. I am very much looking forward to serving alongside you within the North Cornwall Cluster. There are many different ways of being involved with children and family work; willing hands to set up and dismantle, kind hearts to provide refreshments, and friendly ears to listen to children and their families are the most important roles to any activity as they are the glue that holds everything together.